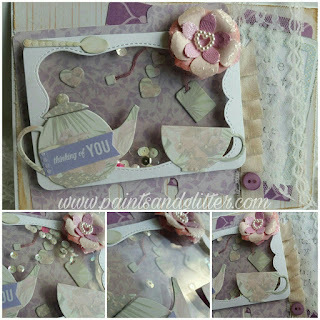 Following is the card I added, measuring 5"by7", in lavender hues, and a vintage touch. I started by creating two rolodex cards that I added to my shabby base, distressed at all sides. 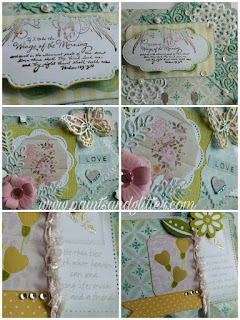 I also added a stamped sentiment, which is tucked under some gorgeous vintage lace. The seam binding and vintage lavender button added the perfect touch, and for a bit of movement, I made it a shaker!! The tea bag was even decorated with embossing thread to make it more authentic, and I made a pink flower for a pop of soft color, and added glitter to it. All of the tea set pieces were up-cycled from packaging, and were beautifully cut with my Spellbinders Platinum 6! 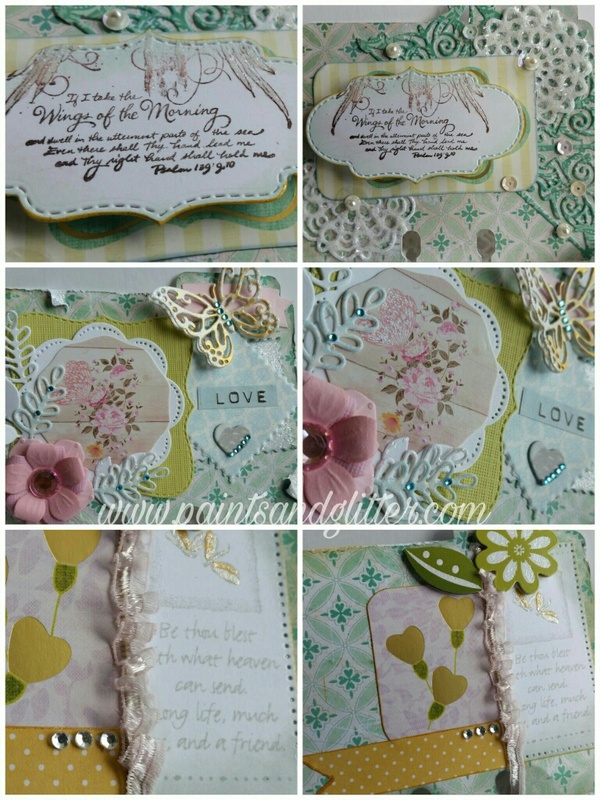 For the Rolodex cards I also used vintage colors and a beautiful set of sentiments. One is a Bible verse, the other a sweet sentiment about friendship. I used gold glimmer mist, my gold Nuvo glitter pen, washi tape, glitter, and sequins for little touches of glimmer throughout. I also added pink silk thread to the bottom pictured card, and a handmade flower.